Bundle 3 shipping details squared away now, article updated, this is a Fri. Nov. 20th re-announcement! Please contact Wiredzone directly at info@wiredzone.com for more information. Choose your Bundle of Joy. 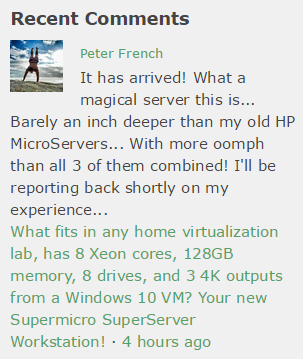 Been thinking about that Supermicro SuperServer SYS-5028D-TN4T, but don't want the higher cost of the SuperServer Workstation Bundle 1, announced back on August 1st, 2015? US - barebones, bring your own storage and OS, ready for virtualization with 64GB, with room for 64GB more. Free FedEx shipping to 48 United States, international shipping also available. 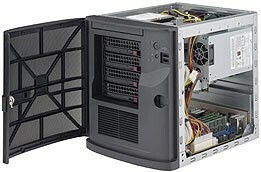 Europe - barebones, bring your own storage and OS, ready for virtualization with 64GB, memory installed and tested. Same exact parts list as Bundle 2, slightly more assembly required, affordable UPSFedEx shipping to EU from The Netherlands. Admittedly takes up to an extra 10 days, but the savings are worth the wait. Customers in any EU country can now order this same-as-Bundle-2 hardware through the same Wiredzone Supermicro Authorized Reseller in the US. All that differs is that the Supermicro factory in California (literally) ships your server and bonus items to Supermicro B.V. in The Netherlands, where they perform their burn-in tests. Bonus items are customer-installed in seconds, and are included in a bag in the same box as the completely-ready-to-power-up system that's shipped out to you. You only pay the EU shipping portion of the journey. Those shipping costs are approximately $65 USD, plust your country's VAT that's estimated before you complete your shopping cart checkout. The total time from ordering to arrival in EU should be approximately 2 weeks. If demand goes up, there is the possibility that this order fulfillment time could be reduced in the future. Serious horsepower in your ready-to-power-up system, delivered to you with two 32GB DIMMs already on board, with room for two more. All the extras included that make it very ready for virtualization, including a tiny USB flash drive and a slender matching 6th SATA3 cable, should you choose to eventually fill up ALL 6 of your drive bays. Oh yeah, your 7th and 8th drives are your future NVMe SSDs in the PCIe slot and M.2 socket. With months of polite folks from all over Europe dropping comments on TinkerTry about how prohibitive shipping fees are, or how hard it is to find an authorized Supermicro Reseller with this model in stock, I'm very pleased that Wiredzone is now able to help Europeans get this particular system much more affordably than ever before. 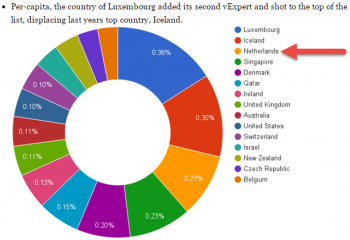 I realize there's still all applicable VAT/taxes and import duties to deal with for your country, but the big savings on avoiding overseas shipping costs is sure to help. Check out your 3 options, read the Q&A/FAQ, and please contact Wiredzone directly with shipping questions. Wiredzone's shipping estimates are available before you give payment information. There is currently a change-over from the Xeon D-1540 CPU/mobo to the same-priced Xeon D-1541 mobo, which offers a slight speed bump (<5%) with more details here. Please contact Wiredzone with shipping, pricing, and order questions. You can also contact me, especially for things I haven't answered in the FAQ/Q&A. You can even drop your questions below, since it's highly likely somebody else is wondering about the same thing you are!